Creating a comfortable and thermally-stable interior environment for a home is a primary concern for the residential designer, and it can be achieved in a number of ways. On the one hand we have passive architectural design, which manipulates natural elements like sunlight and wind to achieve this stability and comfort, and on the other, there’s active, which relies on aid from mechanical space conditioning systems. And yet, despite a growing societal awareness about human-caused climate change, it appears that the uptake of mechanical space conditioning systems and active design in new homes and renovations appears to be increasing. According to a recent Federal government report, 40 per cent of Australian household energy usage comes from heating and cooling systems, making them the largest energy user in the average Australian home. New research from built environment expert Professor Mattheos Santamouris of the University of New South Wales, paints perhaps an even more troubling predicament. It finds that increased temperatures, population and economic growth, as well as the trend of smaller families living in larger homes could see worldwide cooling energy consumption rise by 750 per cent by 2050. This is all made more daunting when you consider that the vast majority of the world’s residential electricity use still comes from fossil fuel sources. At a local level, 86 per cent of Australia’s electricity is generated from fossil fuels, with 73 per cent from coal and 13 per cent from natural gas. Other than offsetting your client’s energy-use through renewable sources, like solar energy, another potential solution is to lobby them to choose a more energy efficient air conditioner—one that consumes less energy, but will keep them comfortable all year-round. There are two main types of air conditioners on the market – refrigerative and evaporative. It is important to consider which is suitable for your climate, be it a tropical or dry environment. A refrigerative air conditioner cools the air via a method of heat extraction called refrigeration. This type of air conditioner is effective in tropical climates where high humidity is present. On the other hand, evaporative air conditioners can drop the temperature of dry air significantly through the transition of water to vapour (evaporation), which can cool air using much less energy than refrigeration. This method of cooling is only effective in dry climates. Common products available include split system (non-ducted), window/wall units, ducted systems, multi-split system, double/triple split system, and portable products. The Equipment Energy Efficiency (E3) Program is a collaboration between the Australian Government states and territories, and the New Zealand Government which aims to improve the energy efficiency of appliances in Australia and New Zealand. Managed by the Greenhouse Energy Minimum Standards (GEMS) regulator in conjunction with the Energy Efficiency Advisory Team (EEAT), the E3 Program undertakes a range of activities including energy rating labelling, setting minimum energy performance standards (MEPS) and, education and training. The Energy Rating Label is the key initiative of the E3 Program. This label communicates the energy efficiency of an appliance through the use of stars, as well as displaying the annual energy consumption. Star ratings offer a simple and fair way of comparing the energy consumption of products that perform a similar task. The more stars a product has, the more energy efficient it is. An air conditioner’s efficiency is the amount of cooling (or heating) capacity (output) per unit of energy it consumes (input). Air conditioners have two different energy labels: one for air conditioners that provide cooling only, and another for air conditioners that provide heating as well as cooling. All domestic single phase, non-ducted air conditioners must carry an Energy Rating Label, but it is only voluntary for ducted systems. Air conditioners can currently be rated up to 10 stars. If a product is rated at 6 stars or less, it will not show the extra star ‘super efficiency rating’ band. However, looking at the stars alone is not helpful, as the performance of a large appliance that is capable of heating and cooling a 200 square metre house cannot be compared to a small product designed to condition a small bedroom. This means that the cooling and/or heating capacity required to heat or cool the room/house, which can be found on the power input label (measured in kilowatts (kW)), needs to be determined before energy efficiency is considered. When purchasing a new air conditioner, it is important to ensure you’re selecting a suitably sized unit for your application. While air conditioners appear to look quite similar, they come with a diverse range of heating and/or cooling capacities. Sizing for air conditioners is provided as a kilowatt (kW) capacity output figure. Many elements within a home will impact on the size of the air conditioner you require. These include whether you are looking to heat/cool a single room, a larger space or your entire home, size of the room/home, external wall materials, insulation levels, and how many windows you have, their glazing, shading and orientation. Making sure you have selected an appropriate sized air conditioner will not only mean you’ll be comfortable in your home, but you also won’t use any more energy than required. At a meeting in Kigali, Rwanda, on October 15, 197 parties agreed to an amendment in the Montreal Protocol, which would diminish the worldwide use of hydrofluorocarbons (HFCs), a group of greenhouse gases used predominantly in air conditioning and refrigeration. The Montreal Protocol is an international agreement designed to protect the stratospheric ozone layer, which was originally signed in 1987. It sets out a mandatory timetable for the phase out of ozone depleting substances. Mitsubishi Electric Australia recently released the MSZ-GL series of domestic air conditioners, featuring R32 refrigerant technology. Energy ratings for all MSZ-GL models have improved compared to the R410A MSZ-GE Series. The 2.5 kW model, in particular, has a 5.5 Energy Rating making it the most energy efficient model in its class. Long-term efficiency and performance have been considered with an anti-corrosion treatment applied to the heat exchanger of the outdoor unit. The coating, which Mitsubishi Electric call the Blue Fin Condenser, prevents the corrosion of the aluminium fins caused by salt in the air, especially in coastal areas. The MSZ-GL series includes capacities from 2.5 kW through to 8.0 kW. Daikin’s US7 inverter split system is the only split system in Australia to achieve a 7 star ‘super efficiency rating’* using the refrigerant, R32. It provides premium air quality with its humidifying, dehumidifying, ventilating and air purification capabilities that have made it a Sensitive Choice approved product by the National Asthma Council of Australia. Other built-in energy efficient technologies include; 2-Area Intelligent Eye sensors which automatically enable energy saving operations when the room is unoccupied for 20 minutes. Fujitsu claim that its reverse cycle air conditioning systems are one of the most cost effective and efficient ways of keeping the home cool all summer. It features a suite of technologies, like built-in Human Sensor Control, inverter technology, DC Fan Motors and programmable weekly timers, with some models reaching a 5 star energy rating. The LG Premium 2.5kW Reverse Cycle Split System [P09AWN-14] is one of the LG P-series air conditioners. Equipped with Active Energy Control, the LG P series air conditioners allow users to cap the energy consumption for improved energy efficiency and reduced power consumption at a reduced cooling output. Wi-Fi smart control* lets users control their unit’s energy usage. Additionally, the Standby Mode feature minimises standby electricity consumption when the air conditioner is not in use. The Samsung 360 Cassette uses omnidirectional airflow discharge which provides fast and even temperature control by reducing minimal hot spots and cold spots. Samsung says its circular design cassette improves performance and energy efficiency. Actron Air’s ducted ESP Platinum series features a Tru-Inverter compressor which reaches to the desired temperature faster and smoother than conventional inverter technology, and maintains temperature to within +/- 0.3°C at the sensor location. Its variable fan technology delivers just the right amount of conditioned air to the zones you want, right down to 20 per cent of the total airflow volume. And, its energy smart zoning means you can condition only the areas you want, right down to a single room. Actron’s energy modelling shows that ESP Platinum is 75 per cent more efficient than conventional fixed speed air conditioners and can save up to $900 a year on energy bills. 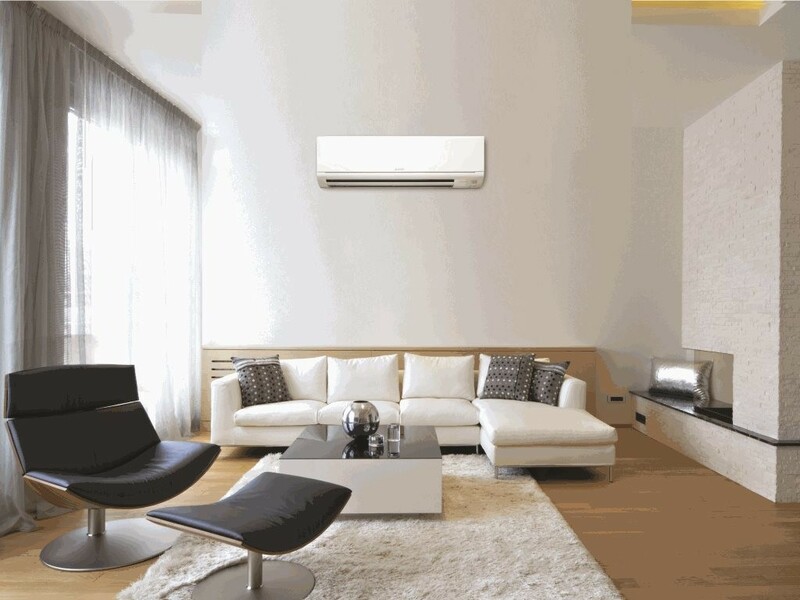 Toshiba has combined two technologies for its ducted air conditioners, creating the “DC Hybrid Inverter” that automatically chooses the better of the two control methods based on the actual conditions at the time. This solution provides high capacity only when it is necessary while also minimising running costs. As a result Toshiba air conditioners offer a great reduction in energy consumption without compromising the powerful operation.